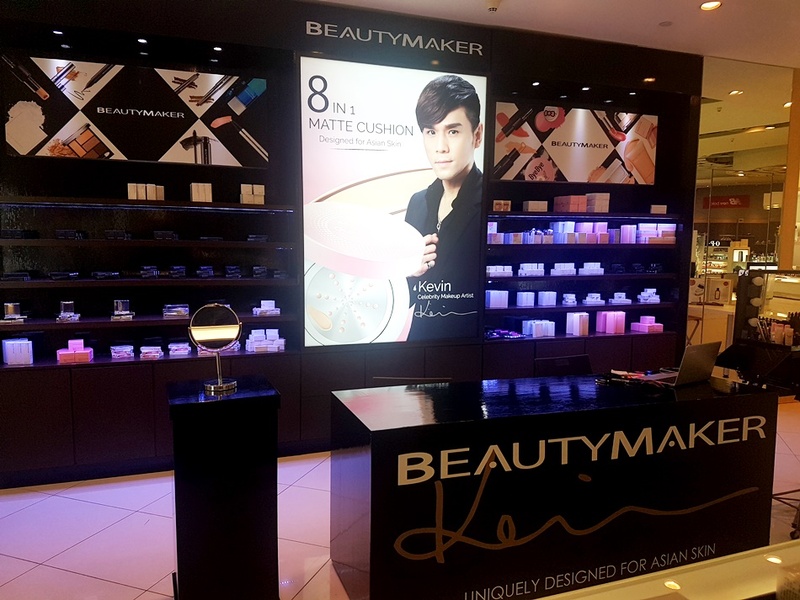 So, the brainchild of Taiwan's popular MUA, Kevin, is now in Tangs Vivocity! I chanced upon their new counter the very first day they opened shop, and got these 2 products, which were some of the top 10 recommended products from the brand. Let's start with the Matt Cushion Beauty Maker. Instructions are written on the back, in Chinese only. But you know, what matters is the product, so let's get to that. I tried and liked this product. It can maintain your makeup through the day with its mattifying abilities, and it can also serve as a pretty decent pore covering product. I also liked how after application, you just leave it be for 30 seconds and it'll turn a little powdery on your face, so you don't feel like you look too glossy or sticky like how Korean BB cushions always make you look. Personally, I think this product is really good for use in Singapore's humid weather. Some instant whitening effect also seen. This product suits me well because it was formulated for combination oily skin (hey, that's me). Next up, Perfect Essence Sunscreen SPF50. When applied, the essence-like texture of the product is moisturising and refreshing. It was also absorbed quickly into the skin. Their Perfect Essence Sunscreen has a oil-free formula, so the resulting texture is really light. This product is suitable for applying after makeup and is supposedly suitable for all skin types. The BB Matte Cushion retails at $40 and the Perfect Essence Sunscreen retails at $29. Another thing to note, is that the Beauty Maker counter sells the products at a slight markup pricing (as compared to the online rates), you can check the price difference on their website. Visit Beauty Maker at Tangs Vivocity if you wish to view their full range of products.